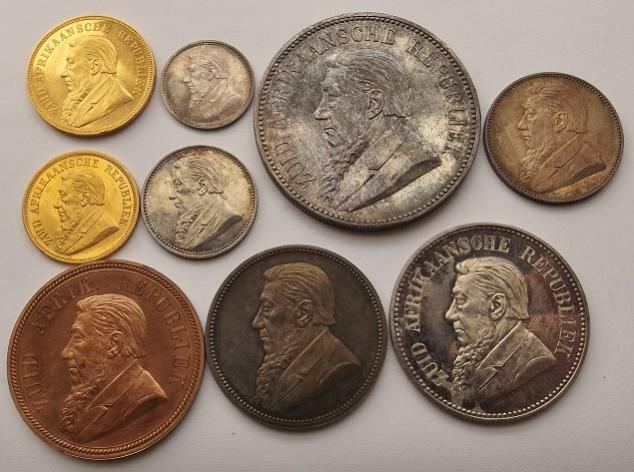 I see that Stephan Welz & Co is auctioning off the Hohmann collection of SA coins on the 14th & 15th of May in Johannesburg. The1939 set is for me truly one of the BIG FIVE in Union coinage. I will be absent from the forum for a while. My wife and I are lucky enough to be off touring Spain by train until the end of April. See attached photos. Viewing is highly recommended. Some great lots. 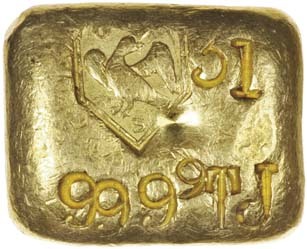 The most interesting one for me is the "Griquatown" gold ingot. This piece have been up for sale and sold a couple of times in the past. I have my doubts about the origin of this piece, and have been scratching around a bit to see if I can find any more info on it, but have found nothing thus far. I wonder if anybody else can shed more light on this item. Slightly different subject but did anyone notice that DNW is going to auction Dr. Frank Mitchell's collection in June? There are no lots listed yet and its likely (or at least possible) that some (or many) were already sold. However, i am actually more interested in the content of this collection than either the Hohmann or Bakewell because I do not know what is in it. Its also possible or likely that many of these coins are not in the combined census today, though I assume if not that they will be submitted to NGC first, since this is the pattern DNW has followed in the past. One such coin purportedly is a 1931 tickey in MS.
As far as the Hohmann collection goes, I did see the auction catalog briefly, but I have not looked at all of the lots in detail. However, of the coins listed in this thread, all of them have appeared at auction previously and to my recollection, multiple times. I am also surprised that the coins in the images above have not been graded, at least with SANGS since they are located in South Africa. If they are not, I suspect that the buyer will send them to NGC to capture the spread, just as the buyer of the SANGS Burgess pond did which was purchased from DNW and subseqently sold by Heritage. I have noticed that even while the prices of most Unon coins have lagged, that proof sets are among those whcih have done much better. Last year, the 1931 and 1939 sets. More recently, the 1936, 1937 and the 1943. The 1943 in the recent Heritage sale "pulled away" from the 1944-1946 and I believe it deserves a relatively substantial premium because I think it is actually quite a bit scarcer. The Hohmann collection sold last night for R3.83 million (without buyer’s premium of 18% + 14 vat on buyer’s premium). The ZAR Proof Set went for R2.05 million and the Burgerspond for R510 000. Regarding the Union proof sets .. Patterns did well – for example Lot 312 went for R32 000. Earlier bank note also did well, a £100 Pound Postimus specimen (lot 599) went for R115 000 :– that must be a kind record for a SA banknote? The uncirculated Mafeking siege 3-shilling, lot 573, sold for R28 000 against a Herns catalogue value of R6000 – R8000. All in all a very satisfying result for the vendor taking into account the strange phenomenon of these old time collections when dusted off after how many years in a cupboard and put on the auction block where some high expectancy lots did rather so-so, whilst other lurking no-one-expect-anything lots had extraordinary results. 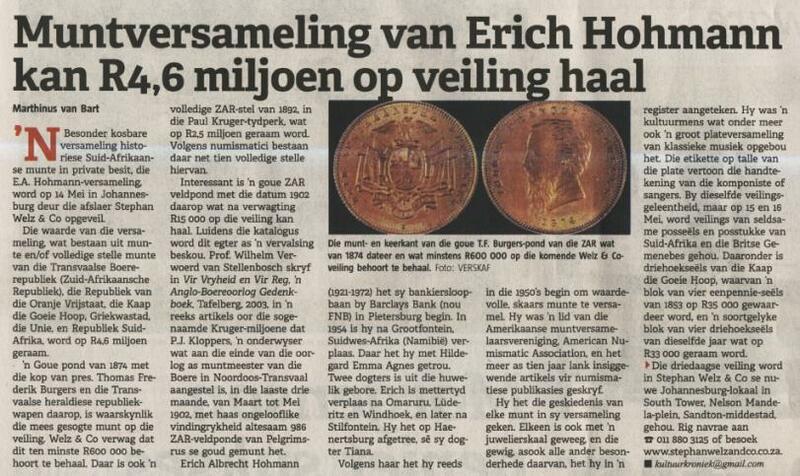 But like I said – a very satisfying result for SA numismatics! Any idea why these coins were not graded? Not sure how many foreign buyers would be interested but it certainly seems that slabbing could not have hurt. Without knowing the actual quality of the collection, I cannot express a real opinion of the results. The images were average and using them for bidding without inspection is risky (as I know from personal experience though for much cheaper coins). That being said, I don't think the price for the 1892 proof set was particularly strong unless the key coins (penny and gold) were somehow impaired. The Burgess pond I would say is a respectable one for an ungraded specimen. The 1939 proof set, not particularly strong even considering the bronze coins. It sold for about 40% of the last one sold by Heritage. Likewise for the 1943 at about $3000 versus $13000 on Heritage.. Same goes for the nickel penny patterns, both the OFS and Cape of Good Hope. The latter coin particularly I do not recall seeing before. The conclusion I reach from these results is one of the following. Either many of the coins are not eligible for a numerical grade which is why they were sold ungraded. Or, the consignor received bad advice from the auction firm and left money "on the table" which will subsequnelty be captured by the buyer. The 1939 Proof set sold low as it was stated that the bronze was impaired. The majority of the patterns were of exceptional quality, I picked a few up which were probably some of the best I have seen, keeping in mind that in the past two years I have handled and sold more than a 100 pieces. There were a handful of patterns with few impairments, but all still gradable. The 1892 Proof set had a few faults here and there but nothing extremely serious, its not the best set ever seen but at the price I thought it was fair. Regarding why the coins were not send for grading... Perhaps they felt that sending over R3 Million in coins over too the US would be too much of a risk and a headache! 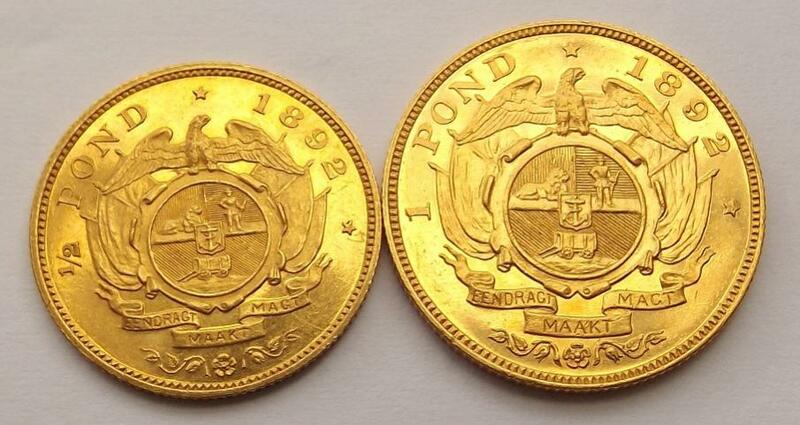 As a numismatist with a deep interest in South African patterns - to me, the "roses" in the bouquet of South African coins - I have to say that I also do not believe that good prices were fetched. Heritage have sold none- bronze patterns at vastly better prices, fetching R120,000 for an OFS 1888 copper-nickel penny (January 2014) and R130,000 for an OFS 1888 penny in aluminium (January 2010). Both of these were slabbed. Thus, R32,000 for the copper-nickel COGH penny at R32,000 was an absolute bargain, notwithstanding the fact that this specimen was unslabbed. I have to agree with Mike regarding the non-bronze patterns. In addition, I was surprised the "heavier/thick" blank patterns went so cheaply. I also wanted to ask why the OFS bronze variety - Lot 318 - sold at such a low price? From my observations this is much scarcer than the other bronze OFS patterns and yet this is only the second time I've seen it offered in the past 5 or more years (have I missed other sales of this variety?). Sounds to me like the seller left "money on the table. Is there a risk sending the coins back and forth to NGC? Yes, that is apparent. It is a personal decision whether to do it or not but someone else will do so and be rewarded for it. Going by your observations, I think the seller might have been better off taking the coins personally to the US and selling them with Heritage. I am aware that this has its own risk but even the price difference on one of those off metal "patterns" would have paid for it. I don't believe there are actually very many collectors for every variety of these "patterns". There are too many of them. I believe that most collectors are probably looking for just one example or maybe one of each where the difference is actually readily visible, such as the nickel vs bronze. There aren't very many collectors who randomly buy coins from anywhere just because they are rare or had a low mintage. Getting away from the coins for a bit, there was one item which I consider was a bargain at the price. The Postmus One Hundred Pound Specimen Banknote at R115K. In the past 15 years, I have never seen one come up for sale. They are extremely RARE. The banknote is worth considerable more. What is the condition of this note? I do not follow currency notes at all except that I know that even generally they are not cheap and much scarcer than comporable period coins. When I have looked at auctions, they regularly sell for $500 to $1000 in top condition regardless of the origin. US currency notes (like the coins) are very expensive and there must be quite a few that have sold and are currently worth more than $1MM. At the same time, there are far fewer colllectors versus coins and though this particular note may be scarcer than most Union coins, I doubt there are very many people who are actually looking to buy it at a much higher price. My guess is a handfull at most. There were only 20,000 of these Hundred Pound banknotes issued for circulation. The number of specimen notes could not have exceeded more than 10. For such a small number of notes, the number surviving is very few thus making this a very very rare banknote. The 1933 Postmus hundred pound banknote was also the only issue. Many dealers have not seen a specimen and hence my comments that at the price, this note was a bargain. I missed that it was a specimen. And while I think of specimen notes as equivalent to proof coins, I'm not sure how note collectors view them. I do agree that numismatically, it is a good value. I am still dubious that there are or are going to be many potential buyers for it at much higher prices and in my opinion, the seller could have captured a disproportional percentage of any incremental value by having it graded by PMG (NGC's affiliate) and selling it through Heritage instead of the local firm in SA which actually did so..